If you can live with its lightweight feel, the Ascend P1 is a seriously enjoyable and powerful phone. 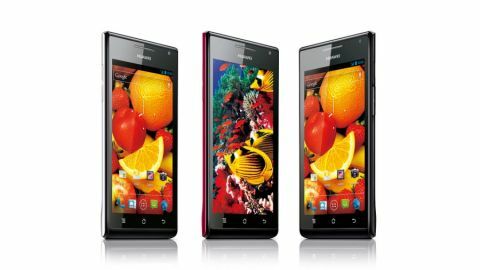 The Ascend P1 is the first of Huawei's high-power Android models to hit the UK, offering a large 4.3" display, coupled with a dual-core processor running at 1.5GHz, with front and rear cameras, DLNA support and full 1080p video capture abilities. The most exciting thing about the P1 is its OS, which gives us an oddly rare chance to use a version of Android 4.0 on a phone that's unskinned and free from troublesome meddling by the manufacturers. There are several Huawei interface skin options within the P1, but you'd be mad not to use the untouched Android 4.0 option. In fact, that's one of the key reasons to buy the thing. Prices are a little up in the air at the moment, but it would appear the Ascend P1 is likely to go on sale for around £340 unlocked, with Vodafone offering it on contracts from £26 a month. These aren't really the sort of super-budget prices we've come to expect from Huawei, maker of the Ascend G 300, the current sub-£100 smartphone of choice. Can the P1 justify a price tag that's asking for three times' as much money as its capable cousin? Huawei's opted to use the standard three Android buttons of Menu, Home and Back, with no place here for the multitasking button found on the likes of the Samsung Galaxy Nexus. The touch-sensitive buttons are backlit, illuminating themselves whenever you prod the screen. You can have a little haptic feedback on them too, if your brain needs telling when you press a thing. It's more rounded than the angular models we've seen of late from Sony or the equally slim and light Motorola RAZR, with no sharp edges to be found anywhere on the P1's body. At only 7.7mm thick it's one of the slimmest phones around today, plus the 110g weight means you barely notice it in your pocket regardless of how "on trend" and skinny-fitting your trousers may be. To help achieve this level of thickness Huawei has sealed the chassis, so you're not able to remove the battery. On the plus side, there is a magical little flap that lets users stick in their own SD card, so you're able to whack in as much additional memory as you like. Round the back sits the camera sensor and LED flash, which have been given their own little mound. The full size SIM slot is also hidden behind a stopper on the top edge of the P1, where you find the micro-USB adaptor and the 3.5mm headphone jack. The power button's at the top of the right-hand side, which seems to be the logical place to stick it these days. The Super AMOLED display, all 4.3-inches of it, is impressive. It's bright, very usable outdoors if you stick the brightness up to maximum, plus it's nice and responsive to touch. It also seems reasonably tough and durable, as it's not yet scratched or scarred in the slightest after a week of use. The back of the phone's glossy and smooth, with a lower, fatter ridge at the bottom that helps you balance the Ascend P1 in one hand. It's a slippery little thing with none of the matte black rubberising we usually see, but it's nicely balanced, so we never felt like it was going to end up in pieces on the laminate. It fits the hand well. Despite the large screen size Huawei's done a good job of keeping the P1 slim, so you don't feel like you're trying to wrap your hand around a dictionary when holding it.